This is the extension locus (melanocortin 1 receptor - MC1R) and it is on chromosome 18. 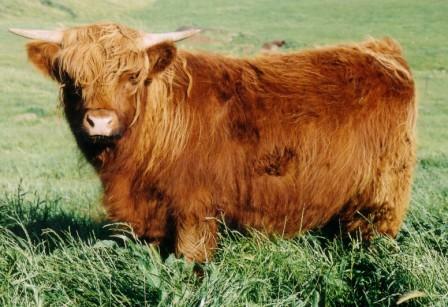 It is thought to determine most Highland cattle colours. Depending on what binds to this MC1R, either eumelanin is produced (creating black in Highlands), or phaeomelanin is produced (red Highlands) (1). Black (ED) is dominant over wild type (E+) which is dominant over red (e) - ED > E+ > e (1). Nearly all black Highlands will be ED/E+ or ED/e, because of the low incidence of this dominant black gene. Although this does not fully explain the occasional black animal that comes from two non-black parents. A separate gene or combination of genes would likely be involved here (some tests are to be done to try to know more about this phenomena in Highlands). The wild type gene allows expression of colour variations at most other loci. For example E+/E+ or E+/e will be needed to express the brindle gene. The base colour for a wild type animal is a reddish colour, but some black hairs may be speckled over the rest of the body, especially the thighs, head and neck. This colou ring may become more obvious as the animal ages, and in summer after they have shed most of their coat. It is also more obvious in bulls compared with females. Some may have no black hairs. I postulate that this wild type colouring may well be the gene responsible for the bus dubh (black muzzle ring) colouring in Highland cows - perhaps a female equivalent of the wild type colouring. Animals with e/e make up at this locus will be red, but interestingly, in many breeds this colour is indistinguishable from the wild type colouring. This is probably true for most Highlands as well. 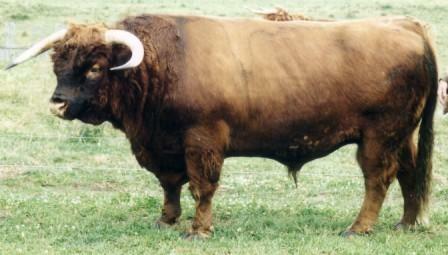 The wild type colouring is thought to be the that of the aurochs, the wild ancestor of all Bos Taurus breeds (4). 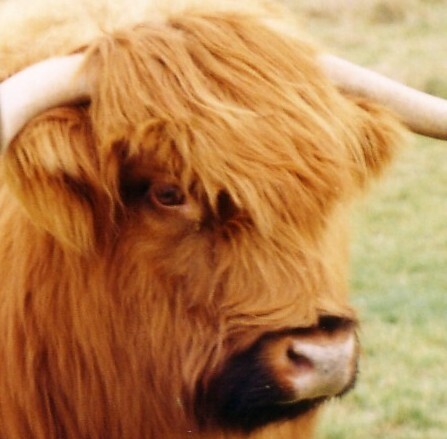 Interestingly some Highland breeders are firm in the belief that the bus dubh marking is a sign of purity and true breeding in Highland cattle.